1.For strawberry filling, in medium saucepot, cook 5 cups strawberries, 1 cup sugar, 1 tablespoon lemon juice, lemon zest, basil and pepper over medium heat 30 minutes or until slightly thickened, stirring occasionally; let cool. 2.For strawberry topping, in medium bowl, toss remaining strawberries, 2 tablespoons sugar and 1 teaspoon lemon juice; let stand at room temperature 15 minutes. 3.Refrigerate ice cream 15 minutes to soften. In large bowl, stir together softened ice cream and whipped topping; place in freezer. 4.On bottom of 9-inch springform pan, cover bottom with single layer of cookies; fill gaps with broken cookie pieces. Evenly spread 2 cups ice cream mixture over cookies; freeze cake and ice cream mixture in bowl 15 minutes. 5.Evenly top ice cream layer with 1¼ cups strawberry filling; freeze 15 minutes. 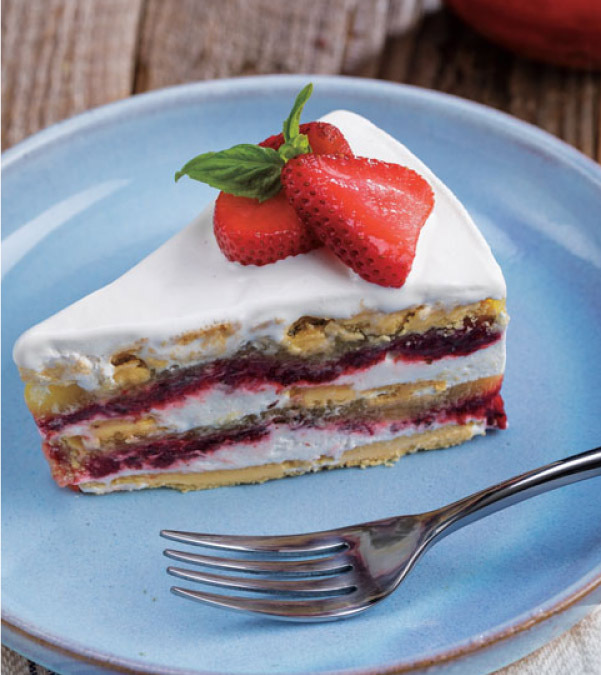 Evenly spread 1 cup lemon curd over strawberry layer; top with single layer of cookies and 2 cups ice cream mixture; freeze cake and ice cream mixture in bowl 15 minutes. 6.Evenly spread remaining strawberry filling over ice cream layer; freeze 15 minutes. Evenly spread with remaining 1 cup lemon curd, single layer of cookies and remaining ice cream mixture over strawberry filling. Freeze 30 minutes. Wrap with plastic wrap; freeze at least 2 hours or overnight. 7.To serve, run knife along inside edge of pan to loosen sides of cake, remove from pan. Cut cake with serrated knife; serve topped with strawberry topping.